Not to be confused with the Labour MP of similar name, Jack Straws is a classic old game of the kind that I’m sure are still available, but yet you never seem to see in the shops any more. It was a game that rewarded steady hands. It consisted of a large number of miniature plastic objects including oars, crutches and swords (the Jack Straws), which were grouped together in one hand then left to tumble under gravity onto a table. Using a small tool (basically a piece of wire with a hook on one end) the aim of the game was for each player to remove a piece from the pile without moving any other pieces. If you did move another piece you were out of the game. Really simple yet it could be quite addictive. It had been around for many many years before the eighties came around, but I think as with many such toys this was the time period when these sorts of games started to get phased out in favour of more modern toys containing far fewer real hours worth of play in them. You might also know this game as Pick Up Sticks, although in truth this is a subtly different game. Instead of little shovels and things the game is just played with a large number of wooden (or plastic) sticks. Since the sticks have nothing for a hook to catch hold of, Pick Up Sticks was normally played just by picking the sticks up with your fingers. This entry is filed under Toys - Boardgames	and was posted on May 10th, 2010. You can follow any responses to this entry through the RSS 2.0 feed. You can leave a response, or trackback from your own site. 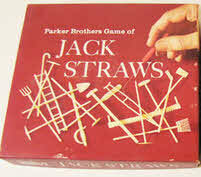 I’ve never seen or heard of Jack Straws before but I remember Pick-up sticks well. A very frustrating game! My sister got a set as a birthday present one year, if I remember correctly. We used to play Pick Up Sticks with the sticks from our Ker Plunk set.